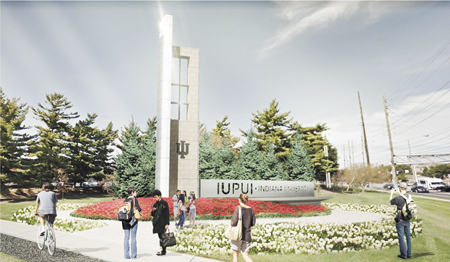 The most prominent “gateway” to campus will be a 52′-tall column at the corner of West and Michigan Streets that is expected to be in place in Fall 2018 (click for a larger view). 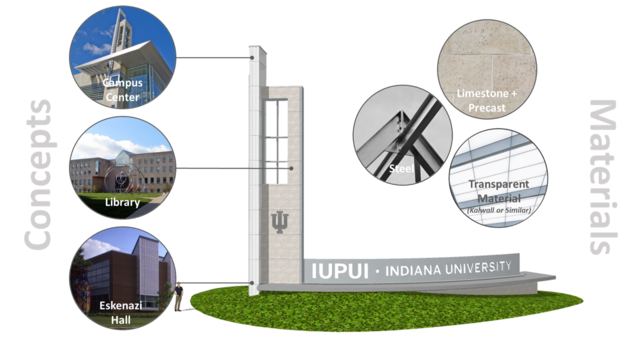 A detailed view of the West and Michigan gateway and its stylistic referents on the IUPUI campus. Campuses routinely strive for a consistent architectural aesthetic to materially distinguish university space, but the IUPUI gateways’ imagination of community somewhat counter-intuitively looks inward rather than at the place it shares all around (and beneath) campus. The traces of a historically African-American community linger in the near-Westside, and the area’s roots in African-American heritage are firmly established in public memory, but the IUPUI gates do not take their stylistic influence from that landscape. For instance, Bethel AME sits just a block from the largest of these gates at West and Michigan Streets. Bethel is a distinctive 1869 brick church that had a four-story tower added in 1894 (the congregation sold the church in 2016, and it is soon to be remodeled and transformed into a hotel). The 1927 Walker Theatre likewise sits a block from those same gates, and IUPUI began an ambitious partnership with the theatre earlier this year. The corner of New York and West Streets will have this gateway. Placemaking hazards being a tired buzzword of neo-liberal planners, but it nevertheless implies a progressive notion of a shared public space whose design respects local social identities and heritage. An architect might suggest that the historical architectural fabric of the near-Westside has been effaced, but this absence of creativity deserves a dose of sober introspection acknowledging the University’s role in the transformation of the postwar near-Westside. 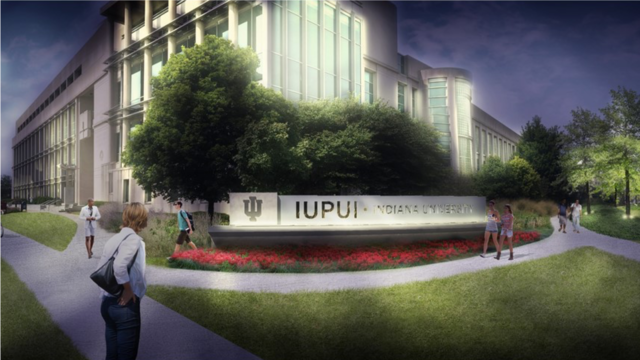 One consultant told the Indianapolis Business Journal that the gateways would help the city “understand the identity of the university,” and that branding would seem to revolve around pride in the increasingly residential university and less about the ways the institution is embedded in the city’s heritage and actively transformed the campus into its contemporary form. A map of the five proposed campus gateways. 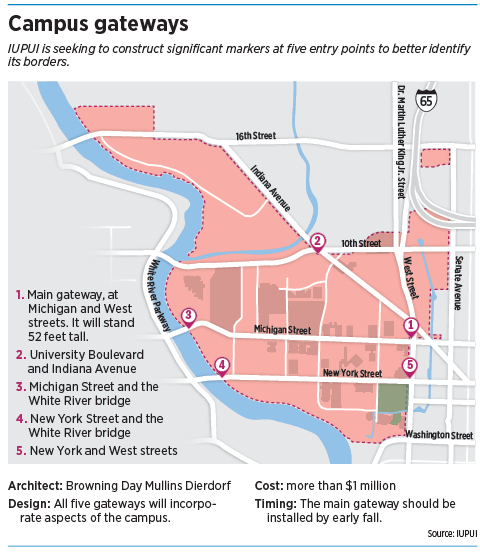 The campus is a unique public place serving the city and materially woven into its’ heritage, and the Chancellor hopes the gateways will materially reflect the University’s desire for “the community to feel welcome … so we have these gateways to remind people this is IUPUI; we are proud of it.” That institutional pride is well-placed, but welcoming public spaces and design might most productively look outward to the surrounding community’s heritage, including the surviving buildings, the vast range of historic architecture in Indianapolis, and the scores of structures that fell to the wrecking ball on campus and Indiana Avenue. Instead, the gates propose to reproduce the aesthetics of a scatter of University buildings and miss the opportunity to root the campus’ identity in the community’s rich heritage. Engaged architecture might look to Lockefield Gardens, Crispus Attucks High School, Ransom Place, and Flanner House Homes for a breadth of stylistic referents that would welcome people onto campus by materially invoking the neighborhood that flourished here before urban renewal uprooted the community. Rather than making the gateways simply an entrance onto campus, they might instead have underscored our genuine institutional commitment to the city and the predominately African-American community that once called campus home. Posted on May 13, 2018, in Uncategorized and tagged African American history, Indianapolis, IUPUI. Bookmark the permalink. Leave a comment.